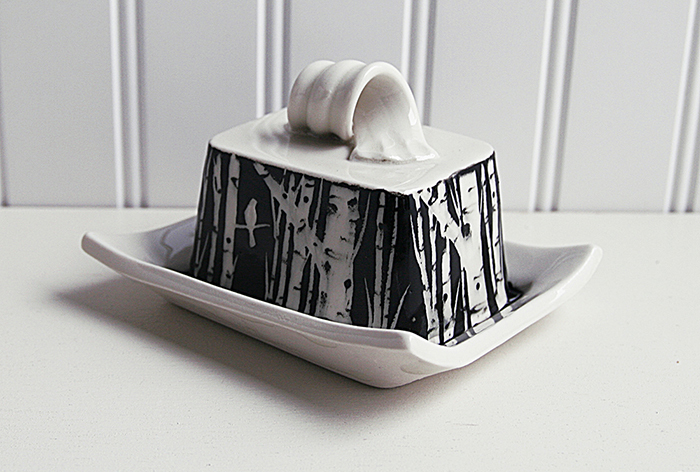 These little half butter dishes with a birch tree design have been a popular item on my Etsy site lately. People seem to like the idea of putting out just a half stick of butter at a time, especially those that are concerned with freshness. A half stick gets eaten twice as fast as a whole, and a lid is critical if there’s a cat around. “In the fridge or left out”, “with a lid or without” are big topics of conversation in my craft fair booth. What I’ve discovered over time is that most people treat butter in the same way their mothers did, so I make a variety of styles that fit the bill. In general though, I’m just a big fan of butter and making dishes to go with it is one of my favorite tasks in the studio. I have to admit, when I saw these butter dishes I was tempted to buy one, even though I love my blue butter dish you made for me! (And the butter sits out all the time, and never goes bad because I eat so much of it). Interestingly, my mother keeps hers in the fridge. So glad you are loving your butter dish. Butter doesn’t last long around our house either! Very graceful piece. It is fresh and clean, and seems to shout out joy and happiness. Thanks, Walter! It always means so much when you comment on one of my pieces. Hope all is well with you!